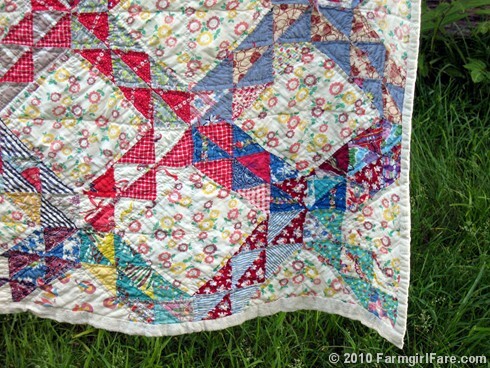 Farmgirl Fare: Monday Farm Photos: Two More Vintage Quilts! So many tiny pieces of fabric. A funny thing happened when I went back to the junk market last week to pick up the rest of my vintage haul from a recent bargain buying spree. . . I ended up buying two more quilts. I actually had this one up at the checkout counter during my first trip, but in a moment of stupidity self control, I said no. When I raced over to check if casually noticed it was still there 10 days later, I figured it was waiting for me. It has a small section along one side that's falling apart, but it survived being washed and might be able to be mended (so now I just need to learn how to sew). It's always interesting to see which fabrics wear out first—the ones from well worn favorite shirts and dresses perhaps? This quilt, which wasn't there during my last visit and, at $29, probably hadn't been in the store for very long, is smaller and heavier and a little less fancy. I just love this angled edge. I keep wondering if it was done on purpose, and if there's a story behind it. What's really neat is that the back is almost as pretty as the front. 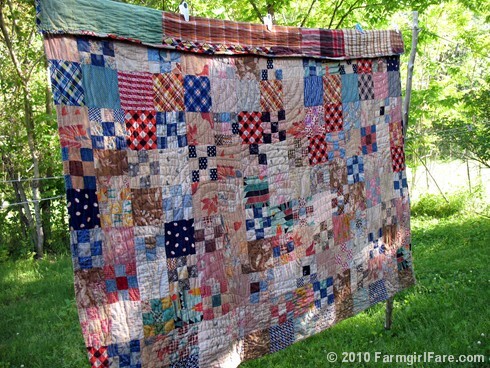 During all my years of buying, selling, and collecting antiques in California, I never got into quilts, mostly because the prices always seemed to start at two hundred dollars—and that was 20 years ago. I'm so thrilled that I've been able to find, afford, and, most importantly, put to good use (two are on the bed right now) these beautiful Missouri treasures. If you like laundry lines as much as I do, you're going to love Wash Wednesday, a new weekly photo challenge at GardenMama. 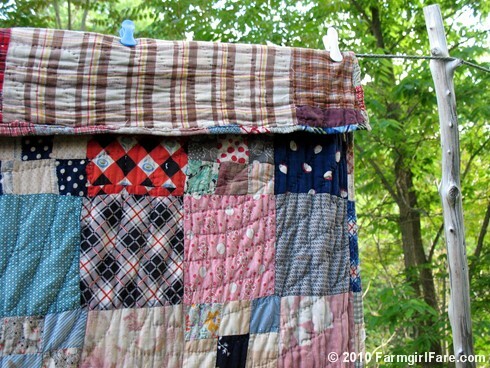 Everyone is invited to share their photos, clothesline art, clothespin bag patterns, or laundry soap recipes. Head over for lots of good clean fun! © Copyright 2010 FarmgirlFare.com, the line-dried foodie farm blog where it's a very special feeling knowing that you're sleeping under an original work of art that someone spent countless hours creating—and it's always fun to think about how many others have admired its handmade beauty over the years, or had sweet dreams while curled up under its weight. Thank you also for the link to the GardenMama blog - love it! Susan....how lucky you are to be able to pick up such wonderful quilts at such bargain prices. We don't have any of these great things in sunny Queensland, Australia. Or let me tell you that I would snap them up ...fast!! 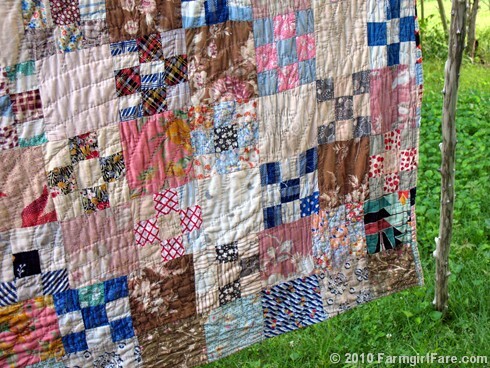 My mother is an avid quilter and collector of vintage quilts. We have discovered over the years, that it is usually the dye in a certain fabric that causes the wear. I bought a vintage swing dance dress last year and when I got it home, I noticed that the black polka dots were mostly frayed, but that the yellow of the rest of it was perfectly fine. Such a fun thing to find and analyze. What lucky finds! 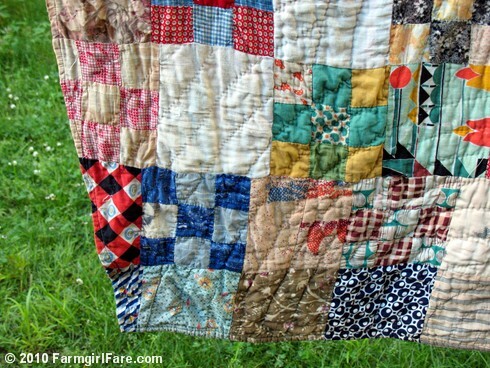 I adore quilts, especially the older, truly handmade ones. I believe you were meant to have the first one because it was still there when you went back and the second one knew it would find a wonderful home with you. They are gorgeous and look well-loved! Don't you wish you could know the story behind them? 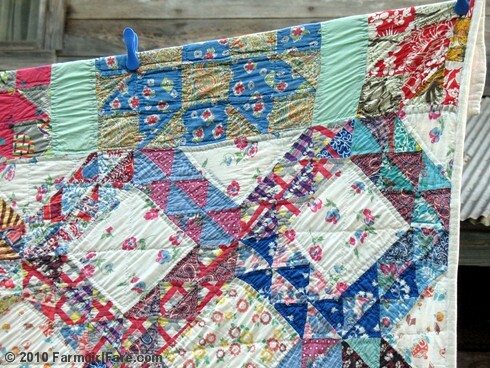 Oh, these quilts are incredible! Thank you for sharing Wash Wednesday! I wish I could come across a find like that! 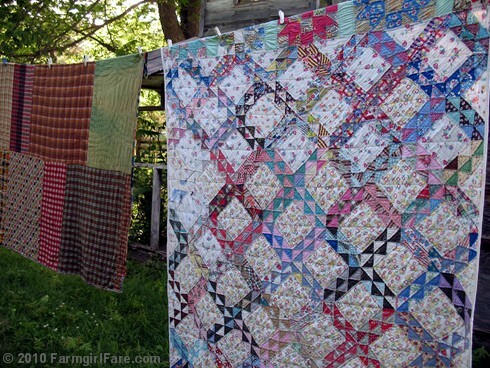 I'd say first step is admitting you have a problem, but those quilts are gorgeous and have me itching to a) make my own, and b) start scouring my area for antique stores in this culture-devoid state (FL). Beautiful! Some great finds. Love vintage because it reminds us of what was. Thanks for adding Judi Hendricks to your list of blogs. Use your recipes a lot and love them. I don't have any vintage quilts, but I'm starting to build up quite a collection of quilted items made by the women in my family, and I love them. I'll keep them until I'm old and gray and they'll bring back so many memories. 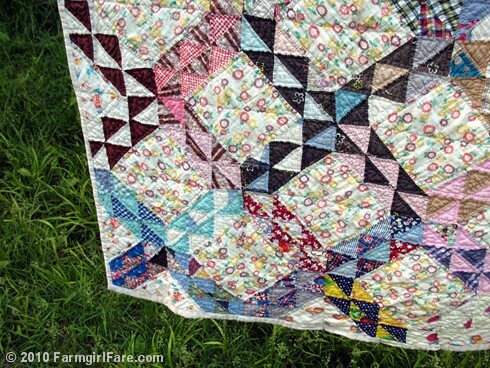 I've had great luck finding reasonably priced vintage quilts at antique collectives in California and lots of other areas. I laughed when I read what you said about it "waiting for you." I feel the same way. 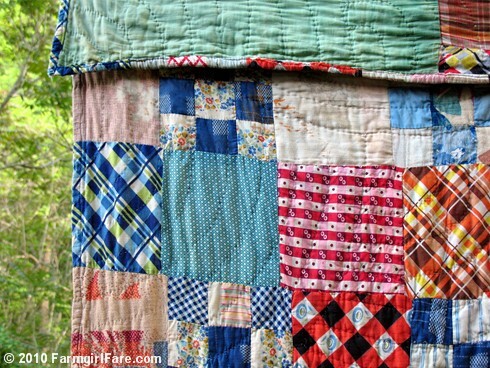 Your quilts are so lovely and make a home feel like home. 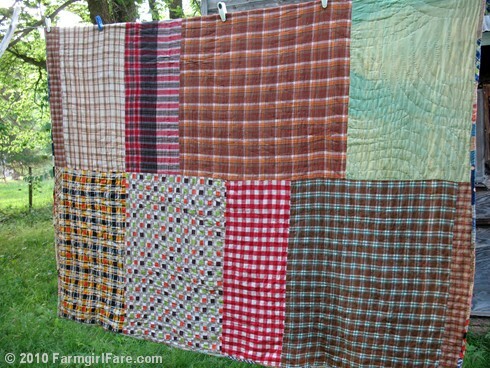 I love having quilts on every bed, tossed over couches and wing chairs, and sometimes hanging on the wall. They are the creative genius of the unsung heroines. 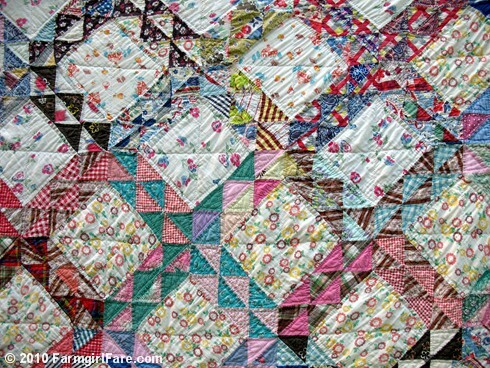 I'm in love with those beautiful quilts!!! Thanks for posting those amazing photos!